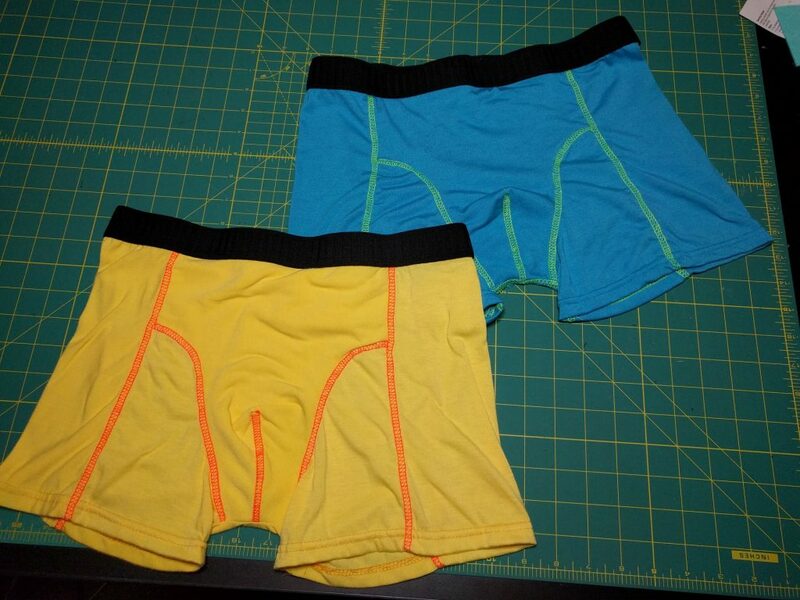 Making my own boxerbriefs has been on my project backlog for a while. 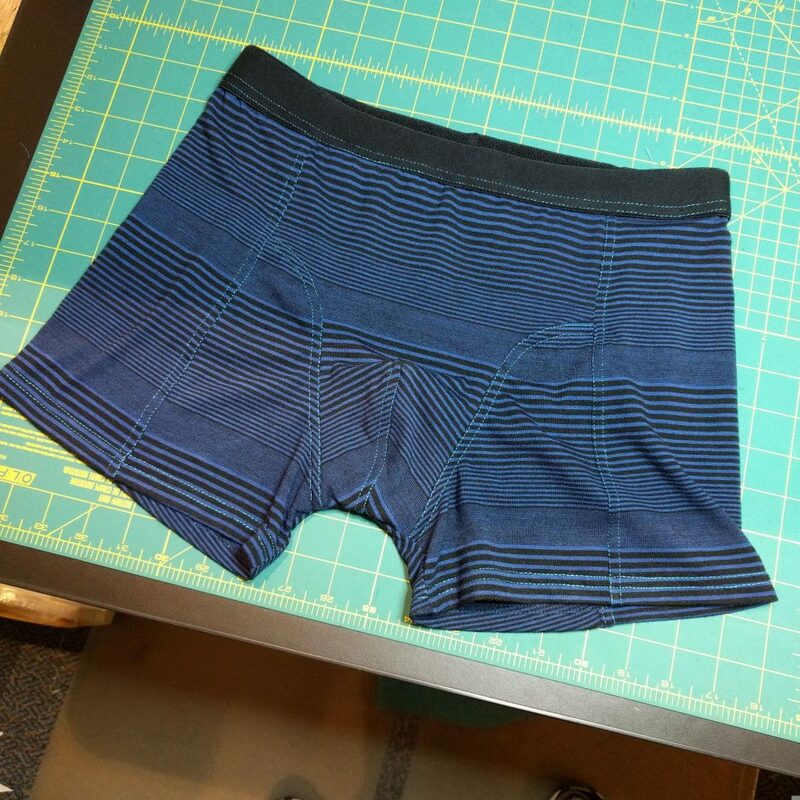 I’ve sewn woven boxer shorts a few times, some very recently, but woven boxers are not my favorites. For me, knit boxerbriefs are definitely more comfortable to wear and they don’t bunch up in close-fitting pants like jeans. You could argue that it’s better to put my energy towards other sewing projects, given that underwear is pretty cheap. 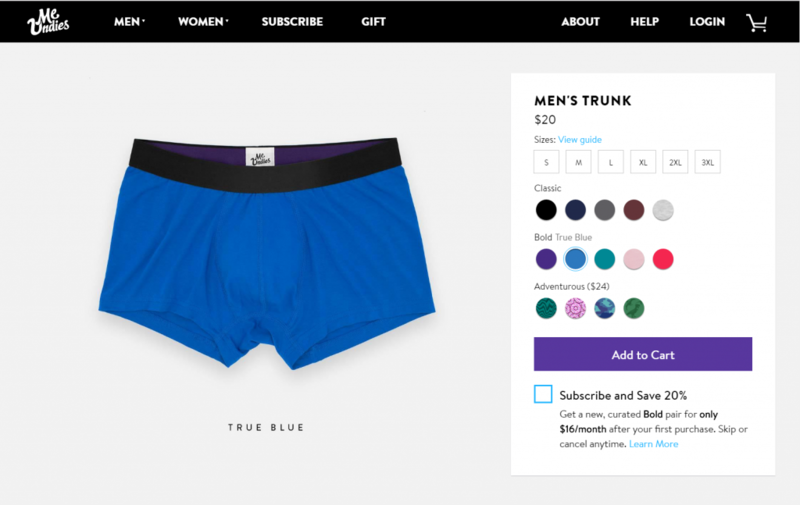 But an entire market has developed around “premium” men’s underwear, made with exotic anti-microbial fabrics, sophisticated styling, and equally sophisticated marketing. I haven’t tried any of these brands, but I have been disappointed by the stuff I have purchased for more everyday prices. A batch of Uniqlo boxerbriefs stretched out after only a few wearings and became uncomfortable to wear. And the stuff from mainstream makers like Hanes is pretty low quality, with thin fabrics that are not very durable. And as always, a big reason why sewists make their own clothing is for fit. This project gave me another opportunity to try the custom pattern drafts at MakeMyPattern.com. 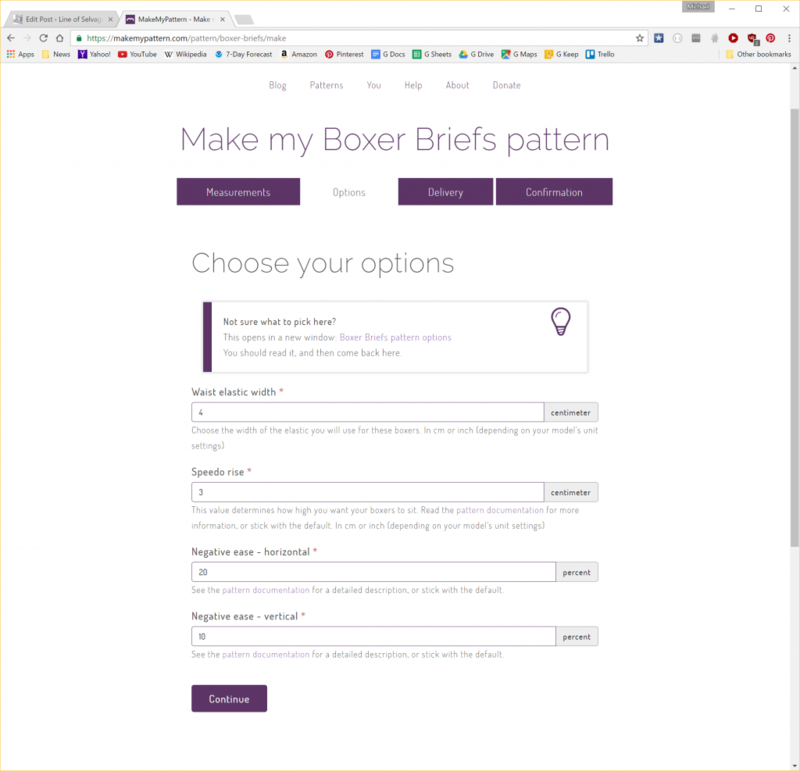 The MakeMyPattern boxerbriefs generator not only drafts a pattern specific to personal measurements, it also allows you to tweak to preference. In particular, you can make high-rise or low-rise briefs, and you can also choose how much “negative ease” to incorporate. In patternmaking, “ease” is extra room, usually in width, added to allow for freedom of movement or for design purposes. Negative ease produces a garment that is actually smaller than the body. This is used with many knit garments, where the fabric will stretch and form-fit the body. I chose the default settings for my pattern, altering only the elastic width to match my choice for the project. The pattern has four pieces – a back panel (1), side panel (3), an inset for the inside leg (4), and the front (2). The front piece has a long, curved dart to accommodate male anatomy. The pattern was so easy to print and cut I actually did it twice, so I could lay out the “Cut 2” pattern pieces without folding the fabric. I used a bunch of cotton jersey fabric that has been sitting in my stash. 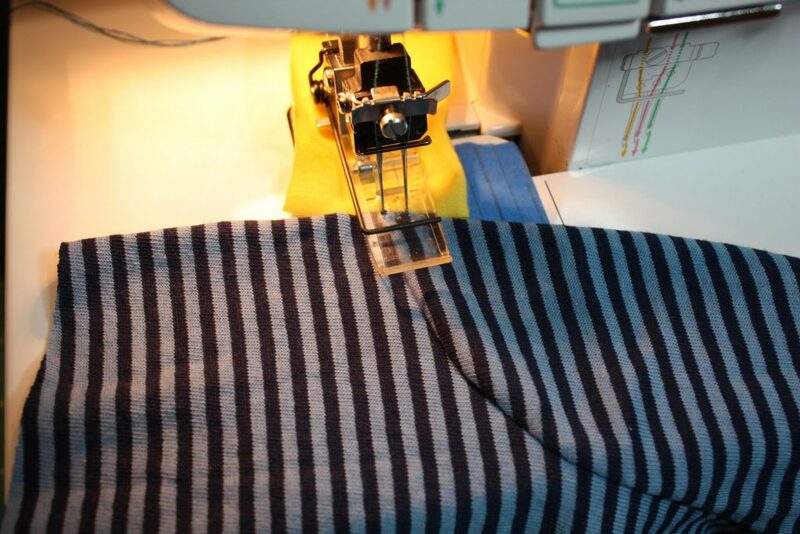 The blue and black striped knit for the pair at the top of this article came from the Bay Area Sewists fabric swap. Most of this knit jersey worked well for boxerbriefs, although the higher quality cuts, with a little more stretch, produced a nicer result. One piece of discount-priced blue striped jersey knit was off-grain. Here in this photo I’ve placed the ruler on the grainline. I intentionally cut the pattern along the grain, producing slanted stripes. The first trial pair used waistband elastic reclaimed from my disappointing Uniqlo trunks. This elastic was pretty good, but it is extremely labor-intensive to rip out all the commercial coverstitching with a seam ripper. For the rest of my “production run” of eight, I used some 1.25-inch waistband elastic purchased from Wawak. It’s not as stylish as what you find on the commercial stuff, but it looks okay. I measured out a length that felt comfortable, then mass-produced a batch of waistbands. To join the ends and form a circular waistband, I used a trick from Nancy Zieman where she butts the elastic edges together, then bridges them with a small scrap of fabric. This joins the elastic while reducing bulk. In my case, I used small pieces of grosgrain ribbon, combined with zigzag stitching to join the ends. Other than joining the waistband, the entire project can be done solely on a serger plus coverstitch machine. The assembly instructions have you assemble back panels and front panels separately on the serger. 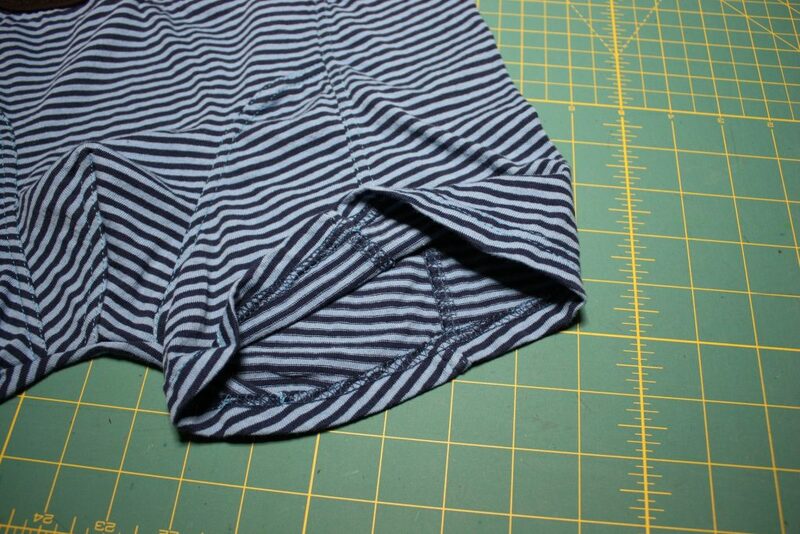 Next, you (optionally) topstitch the seams, join fronts to back, topstitch again, then serge the crotch seam. Finally you hem and attach the waistbands. If you don’t wish to do the topstitching, the coverstitch machine is used only for hemming and waistband attachment. Both of these can be accomplished with a conventional machine using a twin needle for hems, and a zigzag stitch to attach the waistband. 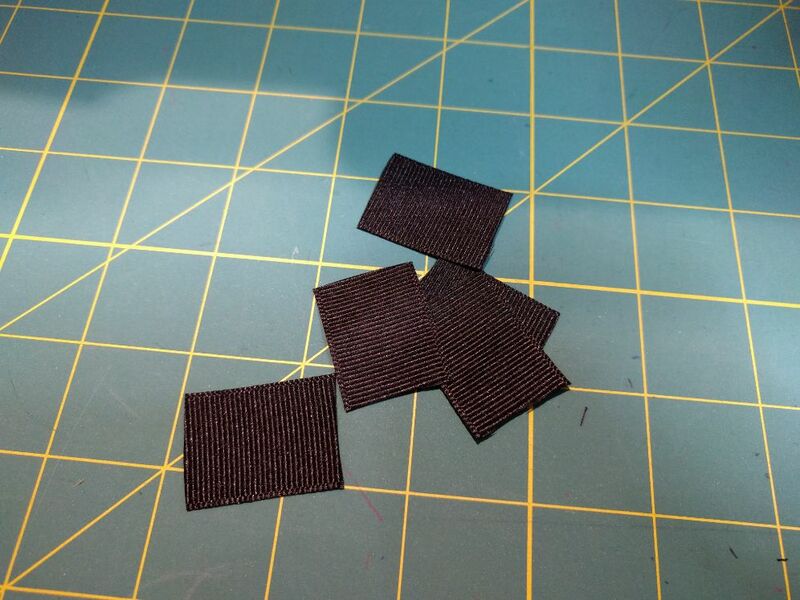 I seamed the pieces with the serger, then topstitched over it with the coverstitch. The lines of topstitching from the coverstitch needles faced outwards. The loopy underside of the coverstitch enclosed the seam allowance created by the serger, as you can see here on the inside side seam. I used a four-thread serger stitch to seam everything, and a three-thread coverstitch for topstitching. Since nearly all seams were topstitched, I could probably have used a three-thread serger stitch for the seaming, rather than a four-thread. But I don’t think the four-thread stitch noticeably affects bulk. To attach waistbands, I used a four-thread coverstitch (three needle threads). I am quite pleased with the performance of my Brother 1034D serger. I can’t say the same for its companion coverstitch machine, the Brother 2340CV. This is a very temperamental machine that requires lots of testing and tweaking to get a good stitch. It’s easy to thread it wrong even though I know how it is supposed to go. Removing fabric from this machine is very complicated, and you can cause a thread jam that can eat your project if you are not careful. And even when you dodge all those minefields, sometimes the machine just throws you a curveball. Here the right thread broke for no apparent reason, giving me a single thread chain stitch I had to unpick. The 2340CV consistently had problems forming the first half-inch or so of stitches. Midway through the project, I remembered an old sewing trick: use an “anchor cloth”, a short piece of fabric you use to begin stitching. This trick solved the problem nicely. In this photo, I’m topstitching a seam, running from the yellow anchor cloth immediately onto the project. Next, is the Colorblocked Collection. Finally, we have the Vibrant Colors collection. On these, I reversed the topstitching to put the looper thread on the outside of the fabric. I used neon-colored Maxi-Lock serger thread in the loopers. These boxerbriefs are more comfortable than anything else in my underwear drawer. The front dart provides the right amount of room and support for those special parts. They are a little extra snug in the seat, but I’m okay with that. Both solid colors (yellow and electric blue) fit a little less snug than the others because the jersey is a bit thinner. The gray colorblocked briefs as well as the blue-black-white stripe pair are both made from a stretchy fabric, and so they are a little more snug. Overall I’m pleased at how well this pattern works across the jersey knits I used for this project. You inspire me to get my serger fixed. Just had a rough day on the job, made worse by a pair of “quitters” sagging low inside my pants. Time to rectify that situation. I’m always thrilled when I can inspire others! Thanks. When are you going to start selling your own goods? That’s a good question. I do think about opening an Etsy shop, but its an extra level of work. In particular, you need to have professional-level product photography in order to sell well. I also haven’t broached the issues around making clothing using standardized sizing, rather than the custom-fit that home sewists strive for. The neon thread is fluorescent, but it doesn’t glow in the dark! That’s probably a good thing. Excellent work on those boxers. I really feel your pain when it comes to using a coverstitch machine. I have an industrial Pegasus coverstitch machine, and it is sometimes tempermental and frustrating to use. Your tip for using an extra piece of fabric in front of the start of stitching is a trick I use every time, you just can’t get complete stitching at the beginning of a seam. I always try to feed several seams through the machine to speed production. Using the coverstitch machine usually adds several extra hours of sewing time to any project since you have to rethread,change needle position, test, redo if you get skips, rethread if the lower looper breaks, etc., etc. … Isn’t sewing fun?!? 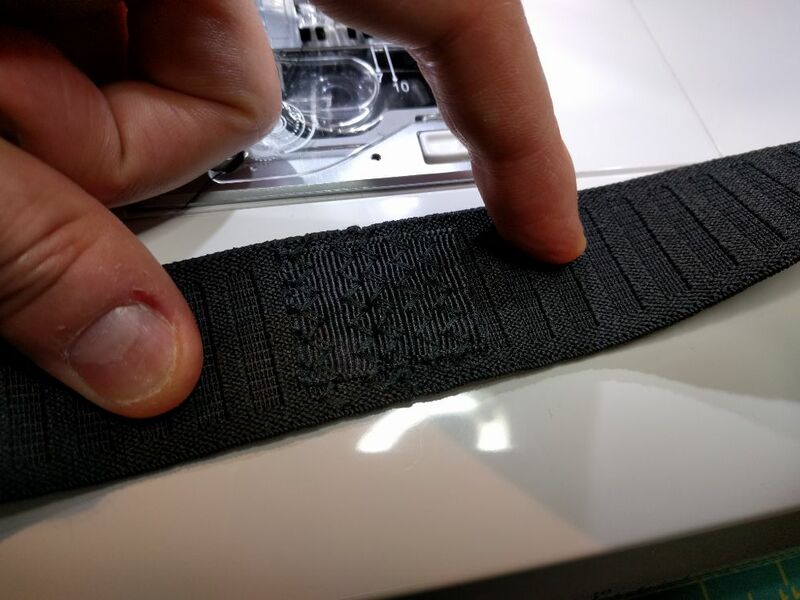 Yes, you just described my experience with the coverstitch machine! I think the project would have taken about one-fourth the time not having to deal with that machine. Do they have the option for the front opening? My husband’s boxer briefs usually do — I’m otherwise very tempted by your review to make him some boxer briefs! This pattern doesn’t have a front opening. 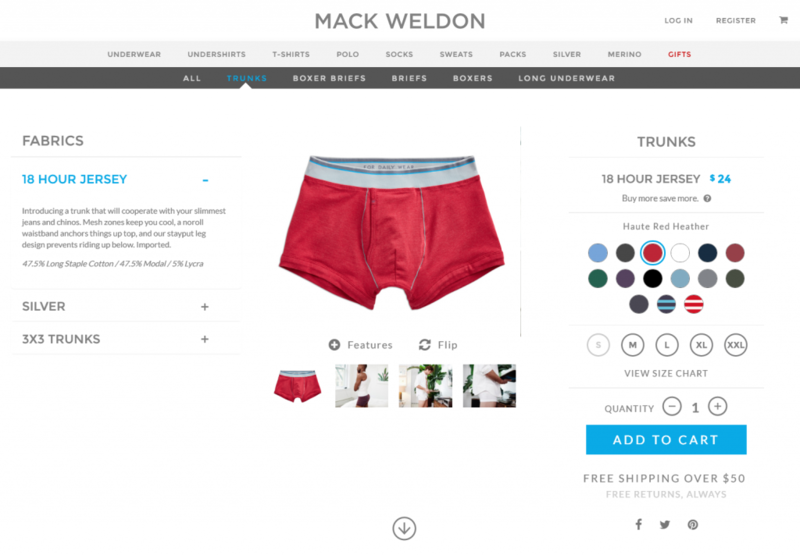 The Thread Theory Comox Trunks might be a good choice for a boxer brief with an opening. I have a Babylock Serger/Coverstich combo and my projects often get stalled at the coverstitch stage. I noticed that your overstitch was great though! I find it hard to catch the raw edge when coverstitching from the right sides. I try to create an even hem, but maybe I don’t iron straight? Any tips? The pattern provides a hem allowance of 1.5 cm (5/8 inch). What I do is to get a seam gauge, then measure about every two inches or so along the hem and pin at each point. On the coverstitch machine, I place a line of blue painter’s tape 5/8 inch away from the left needle. Placing the inside down towards the feed dogs, I carefully guide the hem edge along the tape while running it through the machine. As with all knits, you give just enough guidance with your hands to steer the fabric, but not enough to stretch or distort it. And I don’t sew over pins. My dirty secret is that I didn’t iron the hems before stitching, partly because some of these knits have a little bit of spandex in them and I didn’t want to risk damaging the fabric with high heat. But yeah, it is a good idea to iron the hems. You can double-check the hem with the seam gauge at that point and make any adjustments if the hem isn’t the exact height you’re looking for. But the crucial point is making sure the height of the hem is measured consistently around the entire legband. Also, if you really want to nail things down, you can use Wash-Away Wonder Tape on your hems. This is a water-soluble sticky tape that dissolves in the wash. Measure the hem and tape it into place. 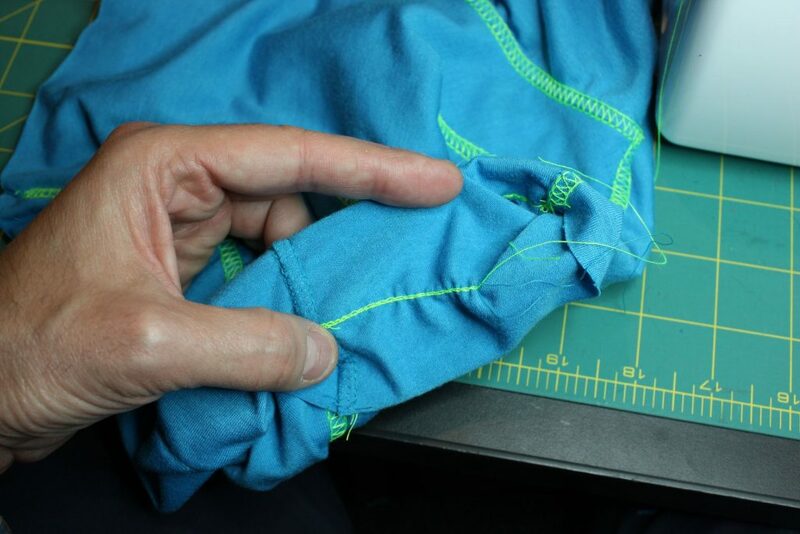 Make sure the hem is even everywhere after you’ve taped it, then run it through the coverstitch machine. The tape is also great for stabilizing knits if you are stitching knit seams or hems on a conventional machine. My tip for CSing hems. 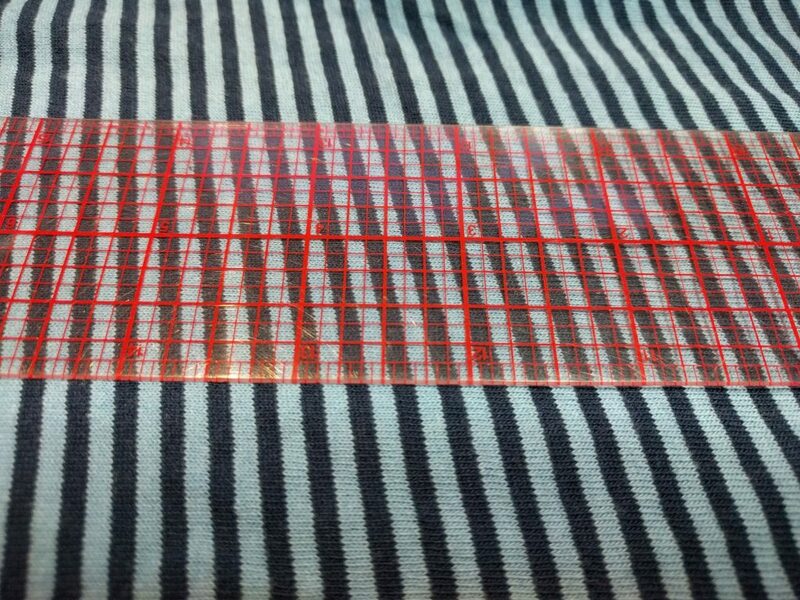 Mark the fold line with your favorite marker, fold and pin on the right side (ironing the fold is optional, can also finger press). After placing the fabric under the foot, locate the edge of the upturned hem with your finger by pressing on the right side and feeling for the cut edge. Indent with your fingernail, and make sure to place the indentation in the center of the CS needles, to make sure the lower looper thread covers the raw edge as you sew. Of course, remove the pins as they come towards the foot. Another tip for CSing hems is to serge the raw edge of the hem before turning up and CSing. This will give a thicker edge, making it easier to feel it under the right side. Serging the edge also makes for a neater look on the wrong side, the serging looking like the lower looper threads and all of it blending together. Hope this helps! I like these suggestions. I also feel on the top of the fabric to make sure the fold is ending where I want it to be, while running the hem through the coverstitch machine. I think you may have given me the tip about serging the edge previously, and I have used it successfully on prior projects. Works well with rolled hems. Excellent work. So when are you going to post pictures of you modeling them? I have been making my own underwear for almost 40 years. I have a simple bikini/speedo brief pattern I made off of existing underwear. It started because I was too cheap to buy more underwear and figured I could make some out of recycled T-shirts. I made one pair out of a Burger King T-shirt with their slogan across the front. After I started working I perversely continued to make my own underwear but eventually shifted from T-shirting to merino wool. All my underwear is now cashmere. My pattern and stitching is not nearly as sophisticated as yours. I use just a zigzag stitch with thread color to match the thrift store cashmere sweater I am up-cycling. The less than perfect stitching is invisible. Anyway, I can claim I am not just being perverse in making my own underwear. I can justify to my eye rolling wife and children that premium cashmere underwear can’t be acquired any other way than making it myself. You did great work, I love the flashy coloured ones with the neon looper thread. Thank you for linking to the site, and a spreading the word. I really appreciate it.